We lost our cockatiel in Northwest, Las Vegas, NV at the Providence neighborhood area (by Egan Crest DR). 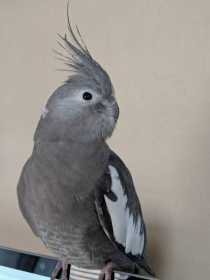 She's gray with some white feathers in her wings. She responds to "Birdy" or "Sweety" and she loves rice. She gets scared easily and must be approached carefully. She was last seen on the rooftops of the houses around the neighborhood.